Harlan County Community Action Agency, Inc. has had a wonderful history since 1969, and since then many residents both young and old have turned to Harlan County CAA for assistance. Some of the services that we continue to provide have been the foundation of Community Action Agencies existence. CAPS (Community Action Programs) – CAPS turned out to be the most controversial part of the package, as it proposed the "maximum feasible participation" by poor people themselves to determine what would help them the most. CAPS were a radical departure from how government had run most social reform programs in the past. Community Action was a bold idea, especially for the federal government. It handed over control to the local level, so that programs were geared specifically for target population needs. This concept, “maximum feasible participation”, represented a new paradigm in the government and many sectors were wary of its innovative ideas. President Johnson selected a member of President Kennedy’s inner circle to head up the newly formed “Office of Economic Opportunity” – Sargent Shriver. 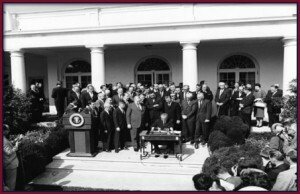 In 1981, President Reagan introduced the Block Grant, which dramatically changed the way federal funding was distributed. Programs including Community Action, would now receive funding through the State Office of Community Action/Services and would be under more intense scrutiny then previous administrations. Community Action of Kentucky now worked more closely with the Commonwealth of Kentucky to implement the Community Service Block Grant (CSBG) and worked to build a strong partnership to provide robust services to Kentucky’s low-income residents. This work is not easy and demand is always shifting and changing. Over the years, the federal government has changed as well. The funding is now part of the Block Grant System, which allows for the flexibility and specialization of unique programs. Poverty is viewed as a systemic problem and Community Action is a systems approach to resolving those issues. There are now over 1000 Community Action Agencies throughout the United States and Puerto Rico. FLEXIBILTY: The Community Services Block Grant, which supplies the core CAA funding, is unique; it is flexible, and it primarily funds local investments in services, facilities and partnerships which are particular to the CAA’s home community. By adding to and altering government programs’ "one-size-fits-all" programming, a community can provide its low-income members the right mix of assistance, encouragement, and incentives to become self-sufficient. IMMEDIACY: CAAs are located in the areas of greatest need, managed and staffed by community residents and often open far into the evening. Therefore, when a family or an individual faces a crisis, their CAA is able to respond quickly with targeted forms of assistance appropriate to the situation; these may well include the mobilization of help from many of the CAA’s private sector partners, volunteers, and faith-based groups. The goal is to promptly stabilize a family, and thus avoid the long-term consequence of costly dependency. However, Community Action also has the capability to sustain long-term involvement in a family’s progress to self-sufficiency, as well as in the development of the low-income community. COORDINATION: A bedrock principle of Community Action is that resources of all kinds need to be integrated so they can be used in combination to solve community and individual problems. CAAs manage more than $5.6 billion in public and private resources annually, serving more than 9.3 million low-income persons; the CSBG-funded staff goes into the community and to other government sources to bring in not only leveraged funds but also hundreds of thousands of local volunteers. TO SUPPORT THE WORKING POOR: Child Care, Adult Education, GED Preparation, Job Training and On-The-Job Support, Job Search Assistance, Job Placement, Job Creation, Small Business Development, Loan Funds, Senior Community Service Employment, Displaced Homemaker Programs, Budget Counseling, Internet Training and Access. TO SUPPORT THE POOR FACING CRISIS: Homeless Shelters & Drop-In Centers, Utility Deposits, Eviction Prevention, Domestic Violence Programs & Shelters, Transitional Housing, Food Pantries Energy Crisis Assistance & Shelter, Emergency Food Baskets, Emergency Clothing, Supplies, and Services – including Medical & Legal Volunteer Help. BOARD STRUCTURE: CAAs are required to have a tripartite board consisting of equal parts of local private sector, public sector, and low-income community representatives. This structure brings together community leaders from each of these groups to collaborate on developing responses to local needs. This allows for Maximum Feasible Participation in both the creation and administration of Community Action programs. VOLUNTEER SUPPORT: The CAA network is one of the largest users of volunteer services in the country. In FY 98, CAAs reported that volunteers contributed more than 27 million hours of service, equivalent to more than 13,000 full time employees. LEVERAGE FOR OTHER RESOURCES: Every Community Service Block Grant (CSBG) dollar spent leverages nearly $4 of state, local, and private contributions combined. The CAA network administers a total of nearly $5.6 billion in federal, state, local and private resources. INNOVATIVE SOLUTIONS: CSBG funds give CAAs the flexibility to design programs that address needs specific to individuals and the local community and to identify specialized resources that fit these needs. LOW ADMINISTRATIVE COSTS: CAAs have very low administrative overhead costs (on average, between 7 and 12 percent). Resources are invested directly in the community and families, not in bureaucracy. COMPREHENSIVE AND RESPONSIVE: CAAs respond quickly when a family or individual is in crisis to avoid costly long-term problems. The highest priority is placed on helping people achieve permanent self-sufficiency. In addition to emergency assistance, a major portion of CSBG expenditures is for coordination among various programs. Integrated service delivery is tailored to individual circumstances. COMMUNITY AND FAMILY PROGRAMS: CAAs provide services that address the full range of family needs – from Head Start and other education and child development programs, to youth and adult employment and training, to services for seniors and the frail elderly. Services are generally coordinated through a case manager or family development specialist. Other CAA programs are designed to strengthen the local economy and develop the community’s infrastructure under the guidance of community leaders. REACHING MILLIONS OF AMERICANS: CAAs provide services to more than a quarter of all Americans living in poverty and to several million more families with incomes only slightly higher than the poverty threshold every year. 2.8 million low-income children are among those served.